With the simplicity of a carburettor and the reliability of an air and oil cooled engine, the KYMCO MXU400 is the choice of farmers. Practical power delivered through a CVT automatic transmission with selectable high / low range for flexible work speeds. 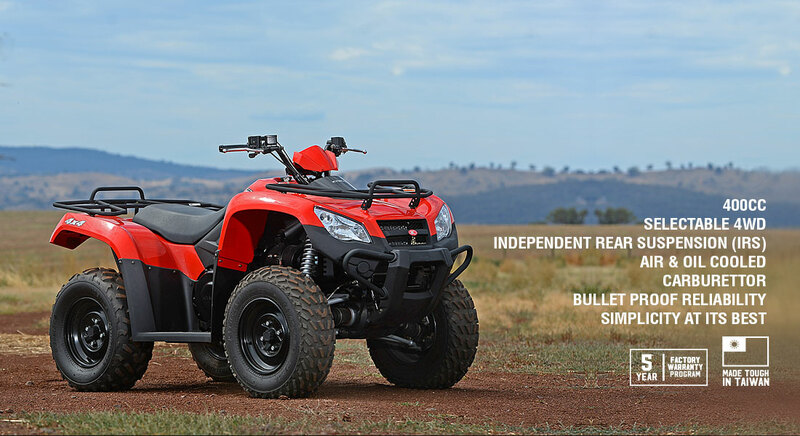 Independent suspension all round and push button selectable 2WD / 4WD will keep you moving not matter the terrain. Simplicity at it best, KYMCO MXU400. *KYMCO products are supported by our 5-year factory warranty program. The program provides warranty for a period of two years from the date of purchase. However, if you have your vehicle serviced exclusively at an authorised dealer and retain an accurate service history, you will be eligible for a further three year extension. For more details, contact your local KYMCO dealer.